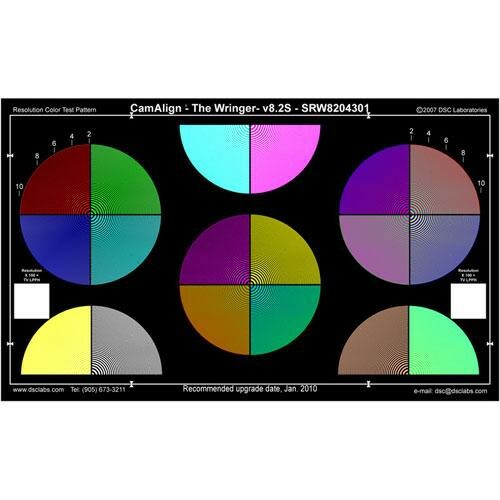 The Wringer Senior CamAlign Chip Chart from DSC Labs is a color calibration chart designed for calibrating color with virtually any video camera throughout the world. The chart includes the latest SMPTE 274M (ITU-R BT.709) international colorimetry standards to ensure its compatibility in virtually any country or region. Many video professionals consider calibration charts a necessity for optimizing camera performance and the production value of images. This chart has been designed with that philosophy in mind and works equally well in engineering or production work. All ColorDuMonde charts feature separation between the grayscale and color bars suggested by Steve Lucas, as well as DSC Labs' exclusive watermarked title and serial bar. This model consists of a series of zone plates, each split into (4) sections with different color combinations and resolution gradations. The unique pattern challenges the capabilities of the latest HD and digital cinema cameras and varying colors are invaluable for pointing out aberrations in lens edges. This chart has been designed to meet international colorimetry standard to ensure its compatibility with virtually all video cameras throughout the world. It features separation between grayscale and color bars and an exclusive watermarked title and serial bar.